With Miami Music Week just around the corner, Armada Music recently disclosed the full line-up of ‘Armada Invites: MMW 2017’. 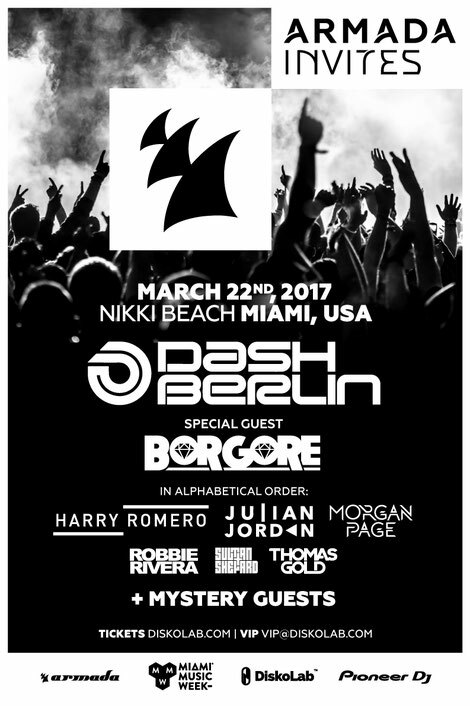 On 22 March, ‘Armada Invites: MMW 2017’ will hit Nikki Beach in Miami with a line-up that includes Dash Berlin, Harry Romero, Julian Jordan, Morgan Page, Robbie Rivera, Sultan + Shepard, Thomas Gold, special guest Borgore and two ‘world-renowned’ mystery acts. ‘Armada Invites’ started off as a recurring event in Armada Music’s in-office club in Amsterdam and reached an audience with its live broadcasts on Facebook and YouTube. Now, ‘Armada Invites’ is turning into a full-blown international event series, with electronic music hotspot Miami serving as its first stop. With the concept, Armada brings together a gamut of artists, all apparently popular in their respective scenes. In addition to ‘Armada Invites: 2017’, Armada has a bunch of other events lined up. The Amsterdam-based record label is returning to Croatia for its third edition of Armada Croatia Festival from 18-20 July, will host its own stage at Creamfields on 25 August, and will continue on a monthly basis with its live stream events, which will be broadcast live on Facebook and YouTube.